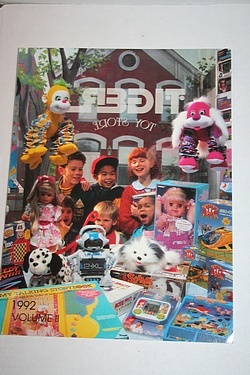 For all of you early '90s fans - ok I'm one too, I can't deny it - here is a Tiger Electronics catalog sure to please! It is marked as being 'Volume II' so I suspect it's only part of their product offering for the year, but it is chock-a-block full of Sid & Marty Krofft's Land of the Lost figures and playsets, and far more Home Alone 2 gear than anyone ever needed or dreamed of. Certainly there are some classy LCD handheld video games as well, and even a few game watches for good measure! Click through the clever catalog cover below to check out this fast-becoming golden oldie!